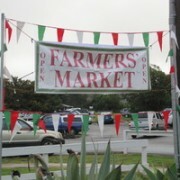 “The Waimea Town Market, held every Saturday in the Parker School yard, opened in September, 2008 with nine vendors. The Market has continued to grow over the last three years and is now home to over 30 vendors and showcases a wide diversity of products. Offering gourmet meals, and plenty of community-friendly picnic table space to eat and converse, the Market has become a favorite Saturday morning gathering place for residents and visitors alike. Live music is often on tap, and the Market regularly hosts free events for all.